In this article, the term "student" may refer to students, admissions leads, or another kind of financial aid applicant. If you offer financial aid to your students, you'll do so on Profile > Financial > Financial Aid. If using the DOE integration to process Title IV Federal Student Aid (FSA), you'll use this view to view and correct aid application details, package aid awards, and handle ancillary items like MPN, loan counseling, and PLUS loan applications. You'll send/receive these and other items through your SAIG mailbox. 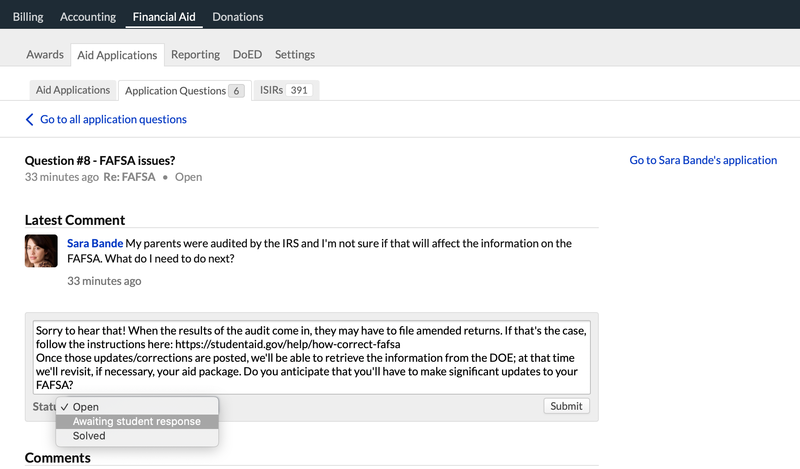 If offering FSA but not using the DOE integration, you'll use the financial aid features to record the information you gather in other systems like EdConnect, and then use the aid awards to pay down student account balances. If you're not offering Federal Student Aid, but are offering things like school-managed scholarships, then you'll primarily use these financial aid features to add awards and schedule disbursements. Additional workflows include handling aid application questions, refunding aid, and printing award letters. Students can use their view of this page to upload application-related files, interact with aid application questions, and accept/decline awards. If you're offering FSA, this article assumes that you're familiar with the definitions, requirements, rules, and procedures described in the Federal Student Aid Handbook. Accordingly, not every field or option on Profile > Financial Aid will be discussed. If you have questions about anything you wish had more detail in this article, please contact Populi customer support. Whenever you're updating information, make sure you have the correct Aid Year selected! Awards lists all the financial aid awards for the year, whatever their status (Setup, Offered, etc.). The Application panel shows general information about the student's aid application and the status of his application components. The student view of the application shows you what the student sees. It lets you access the student's aid application questions. There's also an area where you and the student can upload files—whenever you add a file there, the student will be notified by email. The student provides you with information about his financial need. Often, this information comes to you via the FAFSA, which reaches you through an ISIR. Your school specifies the cost of attendance, information about programs, and any school-specific aid application components. You can pre-fill applications with this information by using an Aid Classification. You can start an aid application for a student when you import an ISIR. The information from the ISIR automatically populates the fields in the aid application. Assigned To: Assign this application to one of your Financial Aid staff. This user will handle the updates and any questions the applicant might have. Status: You have five options. You cannot disburse any awards for the aid year unless the application is set to Accepted. Setup: You're still working out the details; to avoid confusion, the application is invisible to the student. In Progress: You're collecting the information you need and the student is interacting with the application. You can begin packaging aid and submitting it to COD at this point; however, you cannot disburse until the application is Accepted. Accepted: The student submitted all that was asked of him and you've accepted the various pieces. Needs Attention: Some part of the application requires verification. This usually happens at the behest of COD. Canceled: The application is no longer in play—whether because the student bowed out or because of some other reason. Classification: Select an aid classification to auto-fill COA and other school-specific information in the application. Components: Check off the aid application components the applicant must complete. As soon as you have calculated the student's financial need, you're ready to start creating an aid package for the student (adding awards). You'll be able to find the application in the Aid Applications report. If the student has a login, he'll be able to access the student view, on which he can submit application components, accept/decline aid awards, and interact with aid application questions (see below). If you're using the DOE integration, you may receive updates for this application via an updated ISIR. Whenever you receive an updated ISIR for a student, changes or updates in it will be pushed to any existing aid application you have for that student as soon as you import the file. You can also edit particular fields in an application by clicking edit and making your changes. Application questions let the student correspond with your financial aid office about any issues that come up during the application or packaging process. They're started on the student view of the aid application. The student or a financial aid user can start them. You can access them via an alert on your Populi home page, the Questions report in Aid Applications, or via the student view of the aid application. You and the student can also correspond via email. The goal is to set the question to Solved—presumably, after the student's question has been satisfactorily answered! On the student view of the application, either you or the student can start a question by clicking Ask a question. The other person will receive the question via email. Reply to the email; make sure to enter your response above the area indicated in the email. Also, don't edit the subject! That's how Populi matches responses and questions. Add comments on the question's page. As soon as the issue is resolved, set the status to Solved.